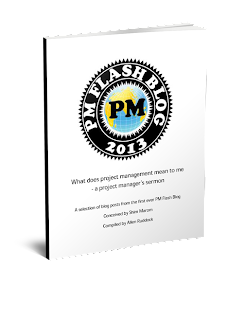 Musings on project management: The 'estimate' thing -- again! Likely you not looking forward to another posting on estimates, either here or elsewhere, since that topic seems to have burned up the PM space over the past few months. Nonetheless, Jurgen Appelo, never to lack for humor and pithy commentary, has weighed in with a few words that sum it all up. When I made my breakfast this morning, I estimated (based on my experience) that two slices of bread and a glass of orange juice would be enough. I’m glad that nobody asks me to do a #bigestimate and prepare my total food intake for the whole year of 2014. That would be silly. But #noestimate, or walking back and forth to the kitchen or hotel buffet for each individual bite, doesn’t sound very practical to me. I prefer to estimate just enough to fill one plate, with a good chance of not having to walk back but also not leaving anything uneaten.